Today we're paying attention to an ugly box of iridescent glass balls I ended up with. I hate the iridescence and tried everything I could think of to remove it so I'd have clear balls, but nothing worked. Rubbing alcohol, nail polish remover and lighter fluid all failed. Then I tried spraying them inside with Krylon Looking Glass paint...another fail. My last attempt inside was acrylic paint, but the iridescence still showed. Grrr. Not being one to waste things, I now had one REALLY messed up ball and a box of just ugly ones. If I can't fix them inside, I'll simply have to cover them up! What are they really anyway? They are little spheres that can hang, that's all! I hot glued twine to a couple of them just like I have to styrofoam balls and they turned out really cute! Just remove the cap, put a little glue right next to the stem and stick the end of the twine to it. Work carefully so you only use a little glue and don't get a huge bump. Be sure to press each row close to the one before it so no glass shows. I made sure every bit of twine is glued on, just in case the glass ever breaks, but I don't know that it's necessary. It's really fun and they really go with my theme. I got my twine at Lowe's. The others I painted with ModPodge and glittered in different ways. I wrapped parts of paper napkin around the ends of pencils and poked them inside to support the balls and so I could stand them in a glass over night to dry. When I ran out of pencils, I did the same with paintbrushes! I also use two bowls per color of glitter. I hold my project over one bowl and pour glitter from it's container, tap the excess off and the next time I want that color, I hold the project over the second bowl and pour the first bowl over it and back and forth till I'm done glittering. It saves having to refill the container when it's empty and I find the bowls don't hold the glitter from static like paper does. You can even rub your bowl with a dryer sheet to further reduce the static, but I haven't found it necessary. The first ball I just made all silver to see how it would look. Very nice! So the next one I made ombre. I painted it all over with the ModPodge, then held it so only the top showed and poured gold glitter on it. I tapped the excess off into my bowl. Then I turned it upside down and poured silver over it. I ended up with a nice ombre glitter ball! Then I started thinking of crisp lines of delineation and got the tape out. I taped to divide the ball in half from the cap on one side to the cap on the other. Then I taped to divide that into a quarter. I painted the quarter with ModPodge and used gold glitter and removed that piece of tape immediately. I went ahead and made the quarter next to it silver, painting against the tape that divided it in half and then just free handing it next to the fresh glitter. It wasn't hard at all. Then I pulled all the tape off and taped to divide the remaining half into quarters and glittered that one. The final quarter was free hand, but frankly I can't tell the difference between the taped ones and the free hand ones! Tada! Really cute! 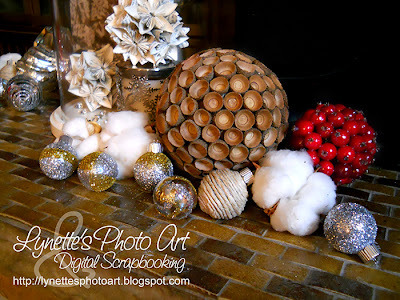 Next I cut the tape to be narrow and put it horizontally around the next ball and glittered it. Pulled the tape off and free handed the center band. Love it! Then I got really daring and free handed spirals! I held it with the cap at the bottom and started at the cap painting a spiral that ended just above where I began, but at the top (which was actually the bottom). Then I started half way around so that I'd be dividing the space into quarters and did the same. Time to glitter gold! I repeated this between both of the gold swirls and glittered them silver. They are my FAVORITE glittered ones!! Somehow I think they sparkle more because only a little is glittered. Sadly the photos don't capture that. In all, it was a fun way to reclaim some ugly balls. It would work equally well with tired old balls, scratched or stained. Ohhh...wouldn't it be pretty making one look like stained glass with bright colors? I just did silver and gold to go with where I was putting them. Hmmmm! There's nothing like the satisfaction you get from reclaiming somehting that was bound for the junk pile! And when they look this great, well it's just happy all around! If you want to know more about the Kusudama Balls in the cloche you can read about them here, here and here, and the Acorn Cap Sphere is done the same as my Crepe Myrtle Pod Spheres here except I painted the ball brown first with the Acorn Caps. The cotton bolls are from my Cotton Field In My Kitchen post here. 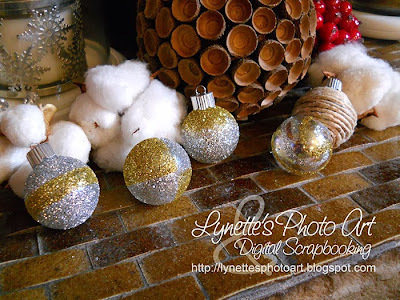 You can see some adorable Santa ornaments I made with the glass balls and glitter here. Thanks for dropping by! Come back as there's lots more and if you haven't been following, be sure to scroll back for all the Christmas treasures!